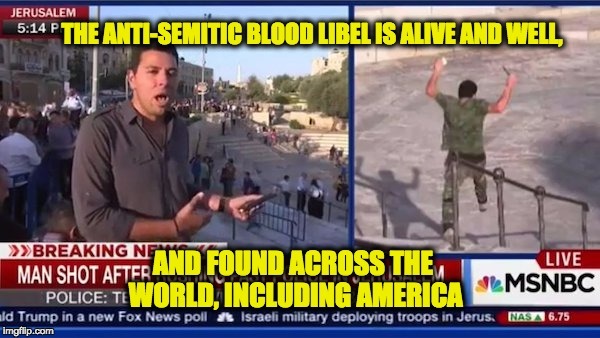 In October of 2015 Israeli police shot a man who was lunging at them with a knife, but MSNBC’s Ayman Mohyeldin claimed the man’s hand was open and couldn’t be holding a knife, this was a anti-Semitic blood libel lie so blatant that host Jose Diaz’ Balart used the video Mohyeldin filed to show that it was very clear that the terrorist’s hands weren’t open and it certainly looked like he had a knife in his hand. See video below(Mohyeldin was not fired for lying on the air). 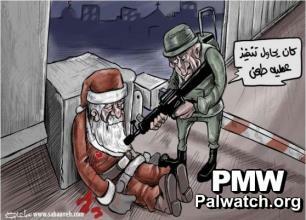 A popular theme in Palestinian propaganda is that Jews are trying to destroy the world. The example below a Hamas party Minister of the Palestinian Authority Parliament accuses the Jews to of sending women with with AIDS to sleep with Muslims so they can infect Muslim men.